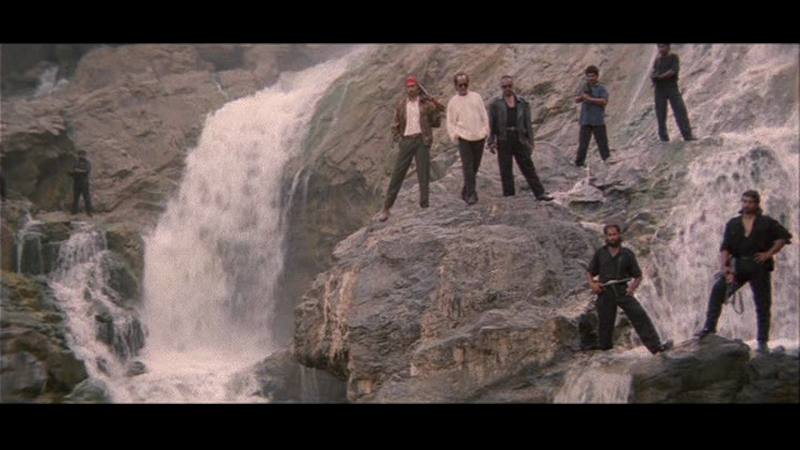 Thiruda Thiruda is a 1993 action film from Mani Ratnam that follows the exploits of two thieves when they inadvertently become involved in a major bank robbery. 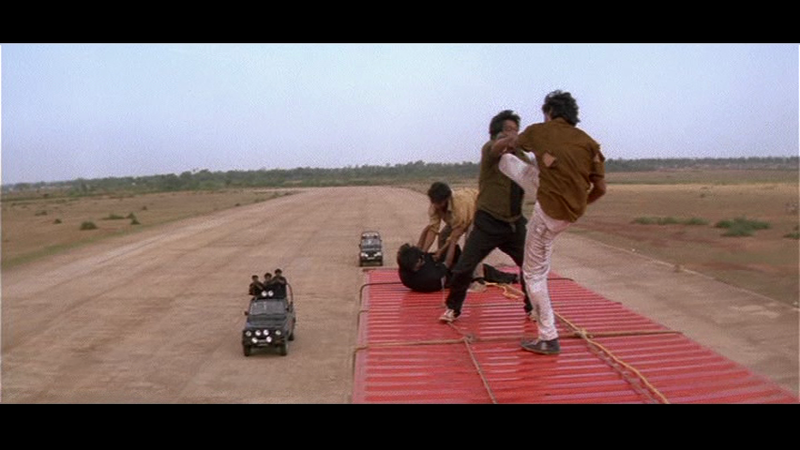 It’s a real ‘action’ film as almost every scene involves either a fight or a chase of some kind (using nearly every single kind of transport you can imagine), and the heroes are always on the move. At almost 3 hours, the film is rather long, but there is so much happening on screen that it’s an entertaining if not completely edge-of-your-seat watch. However the real reason to watch the film is the excellent music from A.R. Rahman which mixes opera, disco and electronic music with more traditional themes to give one of his best and most interesting movie soundtracks. 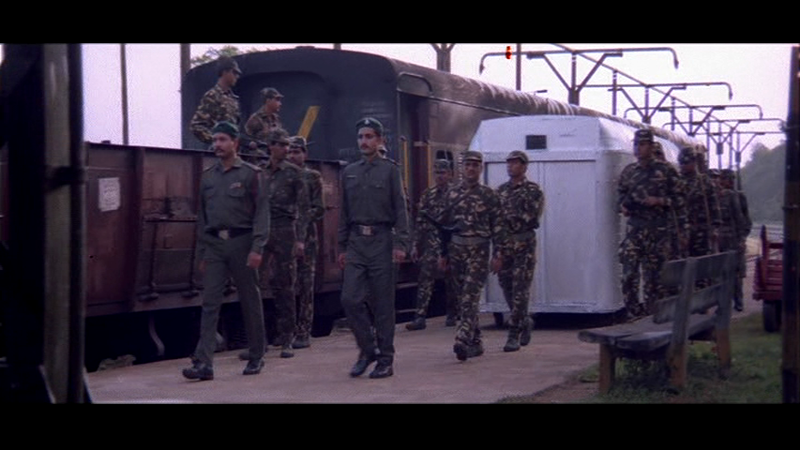 The film starts with the printing of new bank notes, destined to be sent all over India in specialised containers that require a computer card to gain access. For added security the containers also require a password, but since this is printed on the computer card, there may not be quite the level of protection the Finance Department think they’ve achieved. The card looks more like a plastic credit card than the key to a sophisticated locking system, but maybe it looked like modern technology back in 1993 and does mean it’s easily transferred between the various thieves. The card is also amazingly impervious to damage and works even after prolonged submersion in water – that does also apply to the truck carrying the money and the container full of money too though so perhaps it’s the water that has the special properties! 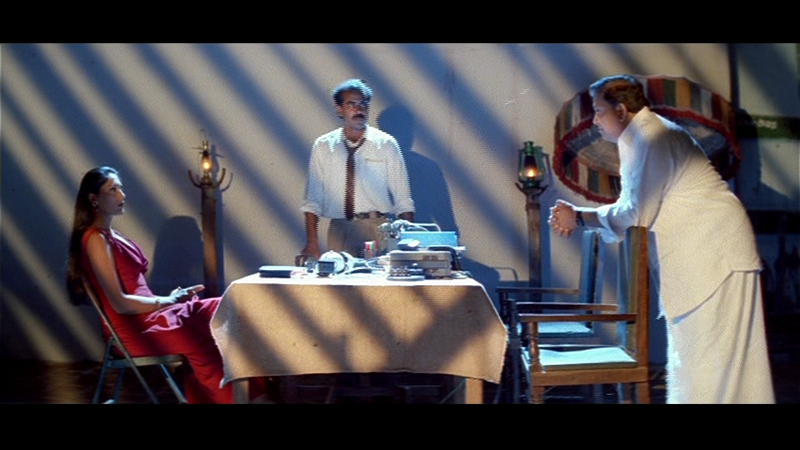 Criminal mastermind T. T. Vikram (Salim Ghouse) has various lackeys in India who steal the money for him, but his chief accomplice Ashok (Ajay Ratnam) is quickly apprehended and arrested by CBI chief Laxminarayana (S. P. Balasubramaniam), prompting a rather juvenile temper tantrum from the boss. However after an unpromising start, Salim Ghouse settles into the role of evil mastermind and enjoys himself immensely as he executes people who displease him after he heads to India to find his money. I like that his gang mange to arrange themselves artistically before starting to menace their targets and even the initial robbery is carried off with precise timing and a pleasing display of acrobatic moves on a moving train. Before his arrest, Ashok manages to send the vital computer card and a cryptic message to singer Chandralekha (Anu Agarwal) who skips out before the CBI manage to arrest her too. 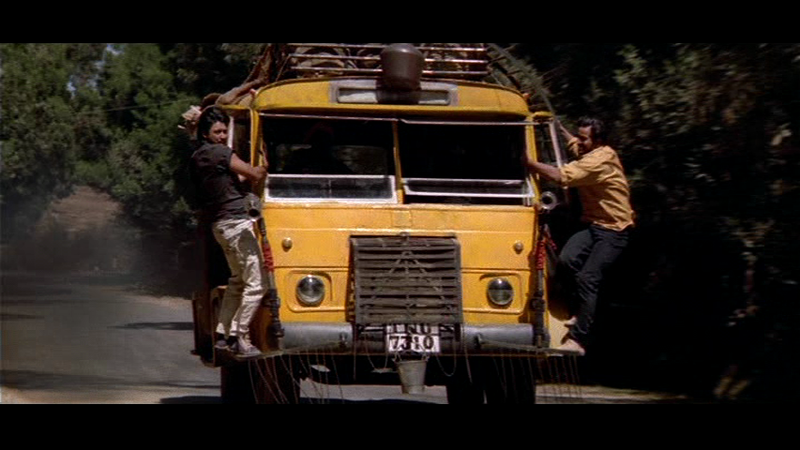 Meanwhile petty crooks Kathir (Anand) and Azhagu(Prashanth) are on the run from the police after looting a safe belonging to one of the rich men in their village. During the robbery they stop Rasathi (Heera Rajagopal) from committing suicide, but rather than being grateful she decides to go with them to reclaim her share of the jewellery they have stolen. Kathir and Azhagu don’t want to be burdened with a village girl so they unsuccessfully try to dump Rasathi, until they learn that she is escaping from an unwanted marriage with her uncle and become sympathetic to her plight. The unlikely trio cross paths with Chandralekha and get drawn into the race to find the money while trying to stay one step ahead of the law and simultaneously avoid T.T. 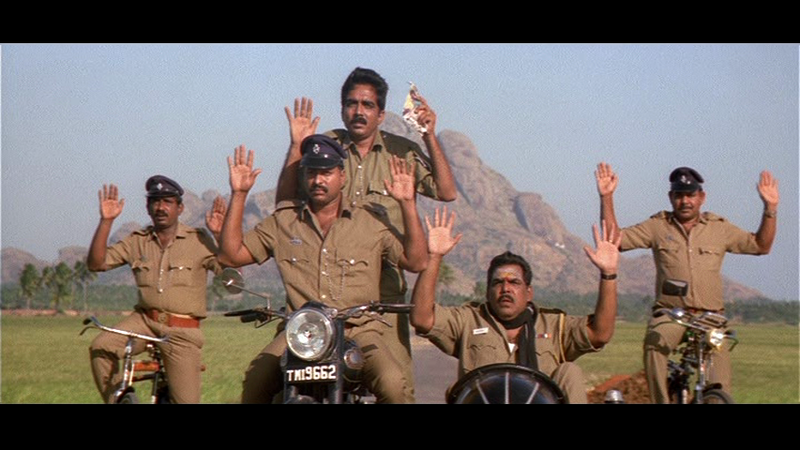 Vikram and his merry band of thugs. 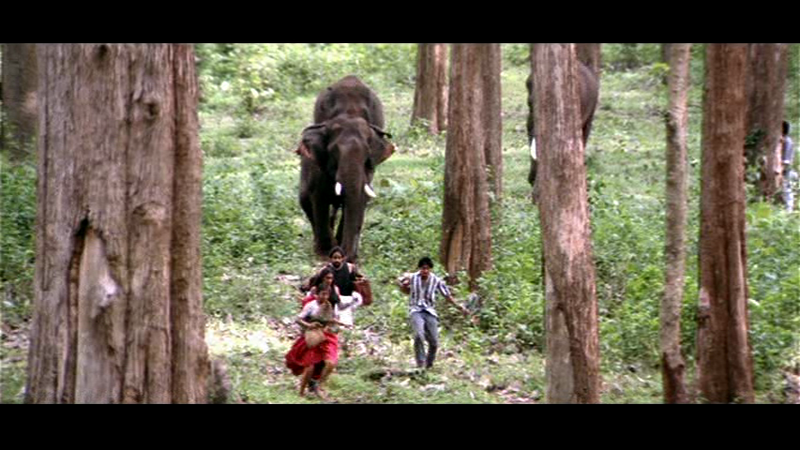 Things move along quickly with a little romance and some attempt at comedy, but mainly there are chase sequences (many, many chase sequences), as Kathir, Azhagu and Rasathi escape from the police, Rasathi’s uncle and his henchmen, the CBI and Vikram and his gang, although not all at the same time. 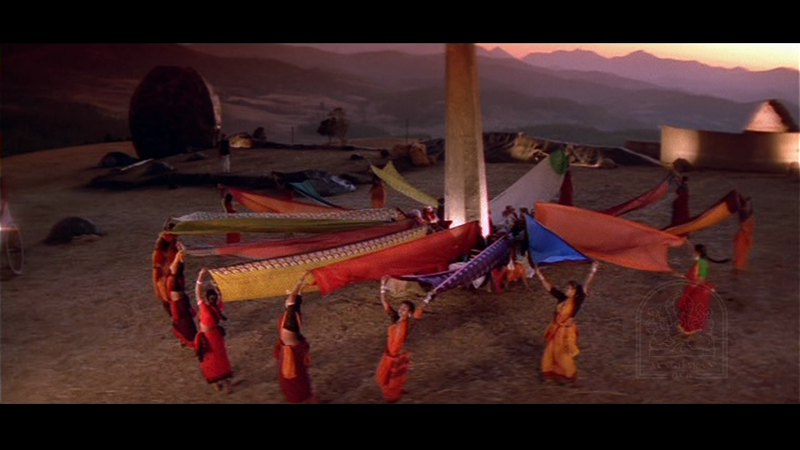 Mostly these are well choreographed with bicycles, motorbikes, cars, horses, buses, trucks, trains and even elephants being used at some point or another, while the art of disguise and misdirection are also used to good effect. The action sequences ensure that the film keeps moving along at a fast pace, which may be why the various characters are relatively under developed and the script somewhat lacking at times. Kathir and Azhagu should have had an easy camaraderie given that they are two thieves who have been working together since childhood, but here their relationship is clunky. This is particularly noticeable when a love triangle develops between the two thieves and Rasathi and there is little rapport or emotion during their scenes together. It may be the fault of the subtitles but the dialogue between the two is also awkward and fails to deliver the idea of two great buddies out to con the world together. Heera Rajagopal is much better as Rasathi and even manages a bonding session with the sophisticated Chandralekha which gives Anu Agarwal the chance to make her character more sympathetic than she first appears. 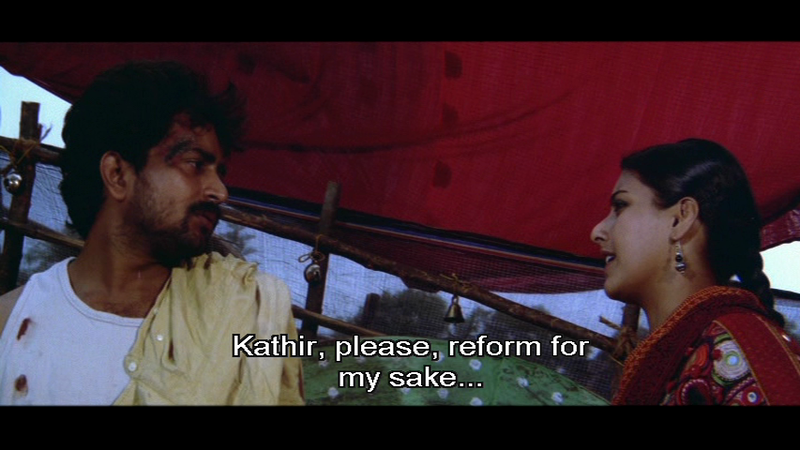 Despite her overdone entry scene, I really liked Heera and her portrayal of Rasathi. Every time I felt she was in danger of becoming a typical heroine, moping around and waiting for someone else to save the day, she actually got up and did something about her situation instead. Anu’s Chandraleka was also a much stronger character than anticipated and although the two female leads have less to do than the men, they give the film some much needed shading and depth. S.P Balasubramaniam is in fine form as the CBI officer chasing after the thieves, and fares better than the leads as far as characterisation goes. He has more of a back story and shows good rapport with his co-workers while showing off his excellent interviewing skills. His Laxminarayanan is one of the more interesting characters along with Malaysia Vasudevan as the police inspector, while Ajay Ratnam, Madan Bob and the rest all provide good solid support throughout. The music really is the stand out performer in Thiruda Thiruda and A.R. Rahman changes from full chorus and orchestral score for the big production numbers to the evocative and very effective a capella song Rasathi, and pretty much everything in between. The mixture of Western and Indian music works well here and it’s probably my favourite Rahman soundtrack just because it is so varied. 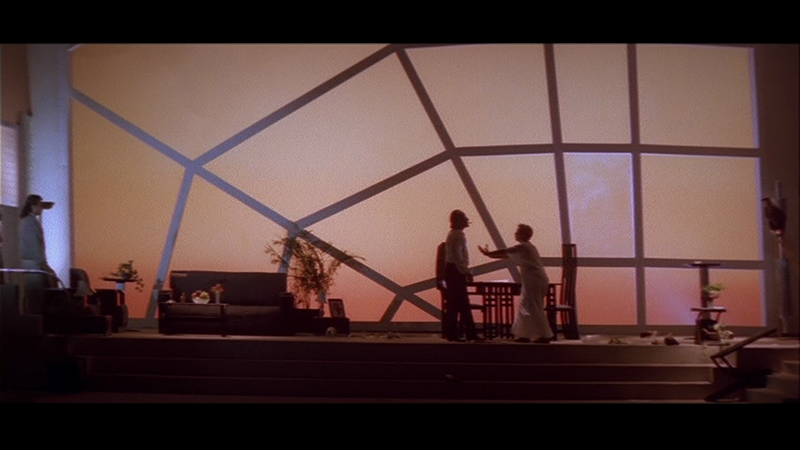 The accompanying cinematography from P.C. 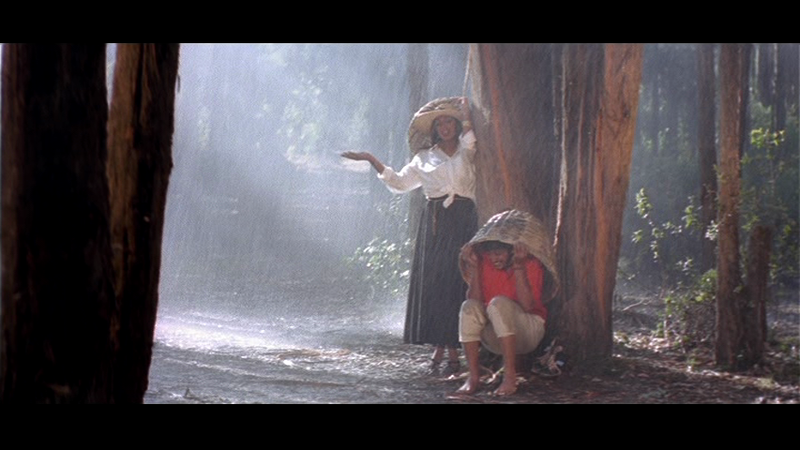 Sreeram is also excellent and the staging of the songs ensures each fits fluidly into the storyline. This is probably my favourite though – a lovely song, beautifully sung by Shahul Hameed with simple but powerful picturisation. While there are a many Indian films that feature bank robberies, I haven’t seen many that follow this style of heist caper more typical of Hollywood films. It doesn’t work as well as it should due to the lack of rapport between the two male leads, but the various chase sequences are fun to watch and the storyline does have a few reasonable plot twists. For a film that does have so much action, there isn’t much suspense but the characters are likeable, the songs enjoyable and overall the film does entertain. Worth watching for the songs, Heera Rajagopal and S.P Balasubramaniam. 3 ½ stars. This entry was posted in Kollywood and tagged A.R. 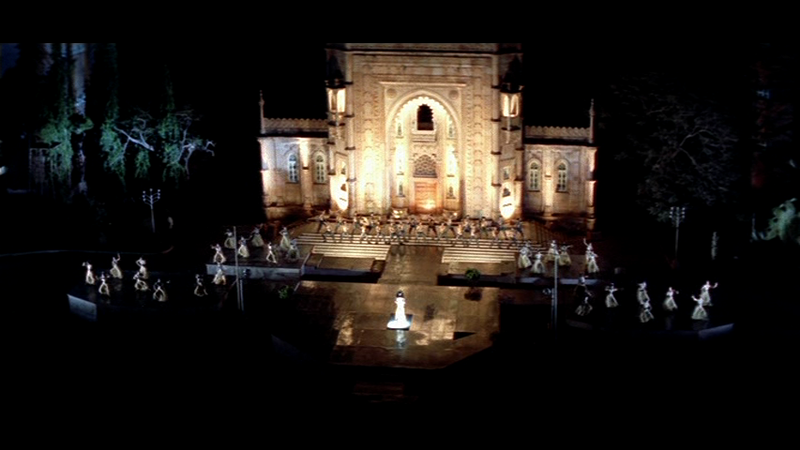 Rahman, Ajay Ratnam, Anand, Anu Agarwal, Heera Rajagopal, Madan Bob, Malayasia Vasudevan, Mani Ratnam, Prashanth, S.P. Balasubrahmanyam, S.P. Balasubramaniam, Salim Ghouse, Tamil, Thiruda Thiruda. Bookmark the permalink. I think the fact that it is so different is why it took me a long time to get round to watching this film. Although despite the differences, Mani Ratnam does add in some personal details about the characters that I don’t think other directors would. For example in the scene where S.P. Balasubrahmanyam is introduced, it’s all about his visit to the temple with his wife. It’s not a necessary addition to the film – Inspector Lakshminarayam only has a few days to find the thieves before the budget is released, but it gives him more of a reason to finish the job, and adds that little more interest to his character. Thanks for reminding me about RGV’s involvement 🙂 I’d read about their collaboration in Baradwaj Rangan’s book – Conversations with Mani Ratnam (a great read!). Interesting that he mentions that they both worked on each others films at the time and that Mani Ratnam was trying to make a better heist film than Kshana Kshanam, (which I do like too). MR said in the interview that they were away on a trip and that they worked on the script for Thiruda Thiruda for a few days and then on RGV’s film Gaayam. In the interview he also mentions that originally this was based on a real-life con in India but that he had to make changes when the original crooks were arrested. Fascinating stuff! 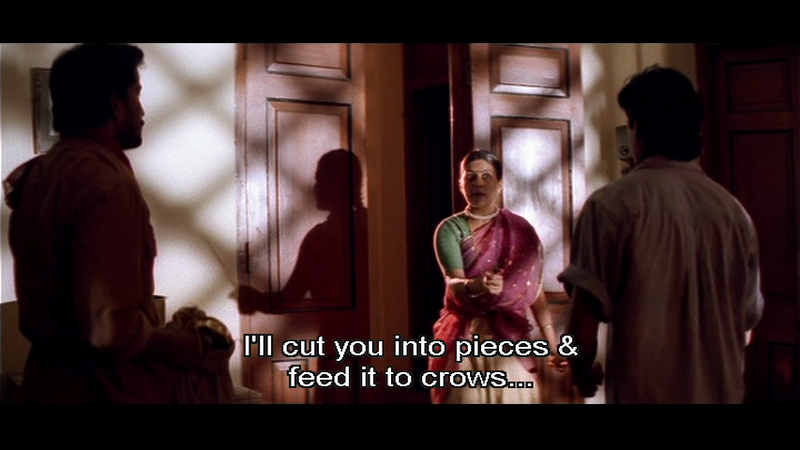 I don’t think RGV was involved in the screenplay. It was wholly credited to Mani himself. @Venkatesh, RGV is credited for the story, along with Mani himself. @Anu: Yes. I was talking about the screenplay! @venkatesh, mea culpa! I was typing from memory but my purpose was to bring out RGV’s collaboration with Mani. Sure! He explains his friendship with RGV and Shekar Kapur in ‘Conversations with Mani Ratnam’. Gaayam, Thiruda Thiruda, and Dil Se were made out of his collabs. with them. That’s the book I keep re-reading – love it! It’s a good insight into his films over the years. Loved this film because it had so much chase, the film was always moving from the start to the end of the film till the last scene. 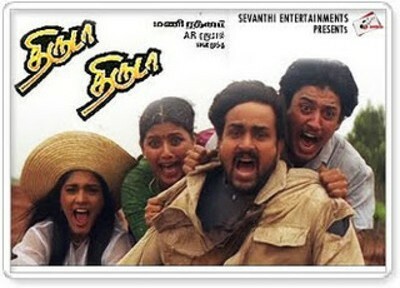 And the music of the film from ARR was special brings back my childhood memories. 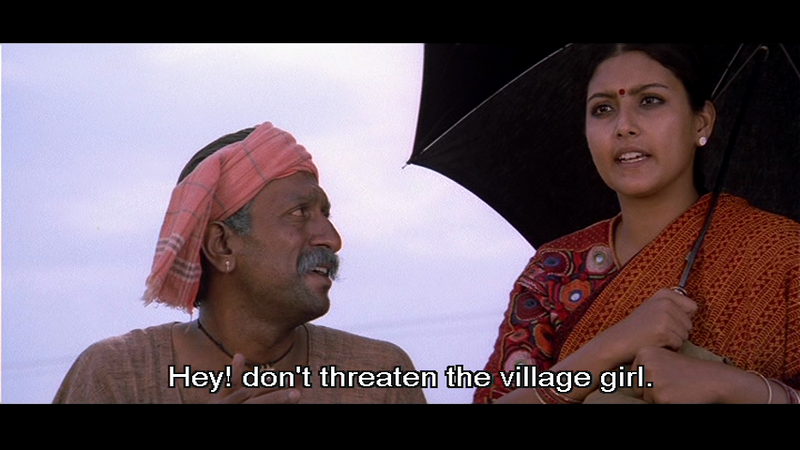 Rasathi was my favourite. Never heard of Capella at that time but loved the song because it sounded so new.